Feel free to use any color you like for this look. Like I said previously I improvised by using a dark brown polish since I do not own a black one. I used red at first but decided to put a hot pink on my nail instead. Choose the colors to your liking. I suggest a dark color and then a vibrant color =). Gold or silver nail art tape or french tip line. I love this look (as I always say with every look) haha. 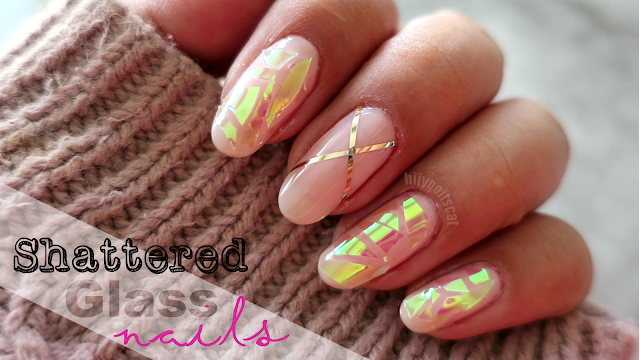 I really like the simplicity and the elegance the nail art tape gives nails. They are so simple to use but tricky to stay on. I like to put a clear base before putting it on and after. Also, don't touch the ends too much cause it will lose the tackiness and start to lift on the side of the nails after a few days. LOVE, LOVE, LOVE IT! !! NOTD: Congrats Obama on a 2nd Term! Bath & Body Works Fall Mini Candle Review & Haul!